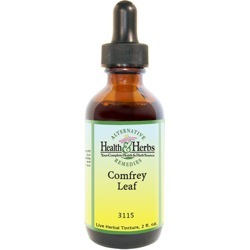 Comfrey Leaf extract is a contact healer and has been used for tissue and bone healing. Until the 1800's it was only used externally as a treatment for cuts, skin ulcers, burns, varicose veins, bronchitis, and rheumatism. Internally and externally, Comfrey is used in the treatment of colitis, diarrhea, periostitis, metritis and as a bulk laxative and sedative. It is credited with being an effective herbal extract in the healing of scars, blemishes, twists and strains, gout, eczema, psoriasis and boils. The leaf has been used in a mouthwash to help with bleeding gums, hoarseness and throat infections. One of the reasons for its effectiveness is its high content of vitamin C, carotene, B12, chlorophyll, and calcium. Comfrey Leaf is a very beneficial remedy for respiratory disorders, gastric ulcers, IBS, and colitis. Considered an overall tonic, it is good for the stomach, liver, kidneys, and bowels. Other indications include mental fatigue, cramps in the legs, anemia, pain, and arthritis. In one study in Germany medical journal "Fortschritte der Medizin" in 2002, found that Comfrey had significant anti-inflammatory and pain-relieving effects for patients suffering from sprains, tendinitis, torn ligaments, pulled tendons, bruises and muscle and joint problems. Use of Comfrey tincture in a salve on the skin reduced the need for non-steroidal anti-inflammatory drugs and improved joint tenderness, pain, movement and was well tolerated by those who participated. Both oral and topical Comfrey preparations have been successful in treating varicose veins, according to the University of Pittsburgh Medical Center. According to a recent study, Comfrey may also work as a pain reducing treatment for acute back pain. The results thus far look very promising. Comfrey root extract shows a great potential to become a popular remedy for treating this and other chronic pain. Using Comfrey Leaf extract in an ointment on the skin reduced the use of non-steroidal, anti-inflammatory drugs and improves joint tenderness, pain, and mobility for its natural analgesic and anti-inflammatory properties. Research has found this herbal extract to be effective for the treatment of arthritic knee pain. Topical Comfrey ointments have been used traditionally for symptoms of osteoarthritis, gout and acute inflammatory arthritis. Participants in the study experienced a significant reduction of pain, along with improvements in quality of life and mobility compared to those who received a placebo. It may also be beneficial for easing the pain and encouraging the healing of shingles. Its expectorant qualities make it a healing aid for bronchitis and sore throats, as its mucilage content coats, soothes and lubricates the mucous membranes of the respiratory system and the digestive tract, including the lining of the large intestine. It may be used as a mouthwash for cold symptoms and bleeding of the gums. Comfrey Leaf is an effective healer because it contains allantoin, and for this reason, it is helpful in growing new flesh and bone cells and for accelerating the healing process. Comfrey also contains an essential fatty acid known as gamma linoleic acid and vitamin B12, which cosmetic companies have incorporated into many beauty products. Comfrey has been found to be useful in reducing scar tissue, fading old scars. Comfrey leaves are rich in carbohydrates, which soothe dry, damaged skin, and the allantoin content, which promotes skin cell rejuvenation and regenerates damaged tissue. Comfrey's astringent tannins form a protective surface over wounds that promotes healing. Research has shown the claims for healing properties Comfrey Leaf treatments, in salves, compresses and other topical applications, are very effective in treating dermatitis, eczema, psoriasis, viral skin infections, ulcers of the lower leg, burns, flea and insect bites and just about any skin irritation. Comfrey leaves have noticeable anti-inflammatory effects which can benefit fungal infections if your skin has become inflamed, hot and sore. When treating skin fungus with herbal Comfrey Leaf extracts, you are treating both the cause and the symptoms of the condition with its natural antifungal properties. Research has shown Comfrey Leaf to be very useful for treating athlete's foot and as a douche for women to treat yeast infections. Sore and caked breasts are treated with a poultice of comfrey. This herbal extract helps relieve tenderness quickly. Herbalists continue to use Comfrey Leaf topically for symptoms associated with acne flare-ups. The plant's astringent tannins accelerate the healing of acne by removing dead tissue and fluid and provide a protective covering for acne infections. Comfrey's anti-inflammatory properties help relieve the pain and inflammation of pus-filled pimples. Ingredients: Comfrey Leaf, Structured Water, 20% Alcohol. Non-Alcohol: Comfrey Leaf, Structured Water, and Vegetable Glycerin. Contraindications: FDA has recommended not to use internally, excessive consumption may be carcinogenic to the liver. Do not use while pregnant. From Pat from Pittsburgh of Pittsburgh, Pennsylvania on 11/4/2013 .